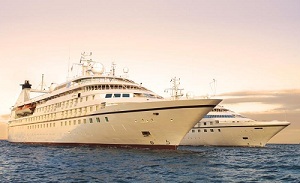 Windstar’s owner, Xanterra Parks & Resorts®, has reached an agreement with Seabourn to purchase their three small ships: Seabourn Pride, Seabourn Legend, and Seabourn Spirit. Under the project name Global Windstar, Windstar Cruises will become the market leader in small-ship cruising with 300 or fewer passengers, with a total of 1,230 berths. Windstar will take possession of the three 104 all-suite ships, which hold 208 passengers each, over the next two years in the Mediterranean. The Seabourn Pride will be the first ship to enter into our luxury fleet in April of 2014. Following a Windstar-branded renovation, where we will give the ship a new name and a casually elegant look, the Pride will set sail a month later in the Mediterranean in May 2014; voyages are expected to go on sale in May of this year. We will take possession of Seabourn Legend in April 2015 and Seabourn Spirit in May 2015. The yachts will start sailing in May of 2015 following their dry-dock period. Global Windstar will also allow us to service new regions of the world such as Asia and South America, in addition to the fifty countries we already sail to. We will continue to focus on the unique destinations that larger ships cannot call on. You may already have noticed the opportunities Global Windstar presents when we announced Windstar’s return to Tahiti in May of 2014. Tahiti has long been the number one destination request from our guests. We are beyond thrilled to be returning. Wind Spirit, our recently renovated 148-passenger sailing yacht, will begin 7-day voyages from Papeete, Tahiti on May 2, 2014. Sailing the South Pacific Islands through November 7, the yacht will also call on Moorea, Taha’a, Raiatea, Huahine, and Bora Bora. We hope you are as excited about this news as we are. Windstar offers you an intimate, unique, and engaging cruise vacation – and we can’t wait to see you on board again, whether it’s relaxing under the sails or cruising on one of our new all-suite yachts.